What would the world’s comedians do without jokes about in-laws? Cultural images of meddling mothers-in-law, good-for-nothing sons-in-law and intrusive siblings-in-law are so pervasive that they may cloud awareness that our in-laws are important to us–and we to them. “In-laws come glued to the people we choose as [marriage] partners. 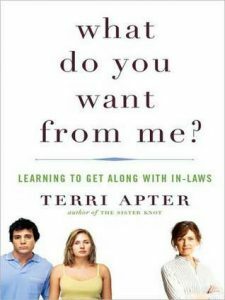 It is high time that the impact of in-laws is acknowledged and understood,” writes Terri Apter, author of What Do You Want From Me? Apter is a writer and psychologist, and a fellow of Newnham College at Britain’s University of Cambridge. Her easy-to-read and helpful book reflects extensive interviews she conducted in the U.S. and Britain. Apter ranks the extended family’s “reality and persistence” among “the best-kept secrets of modern times.” She believes that “extended families form a fundamental building block for the well-being of all family members.” Her cautionary note is that sometimes in-law tensions spill over in harmful ways into a couple’s marriage. “The fear of loss,” –that is, that an in-law is taking someone away from us–“and the longing to be loved are the most common sources of in-law conflict,” Apter says. She insists that it is possible to replace competitive urges in these relationships with collaboration.